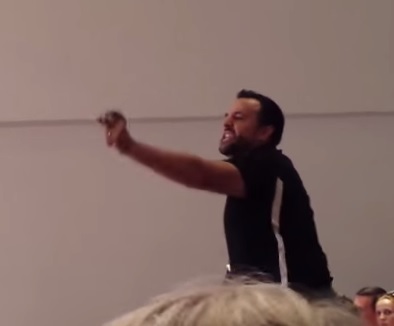 VIDEO=> Man Interrupts Commie Catholic Junk Science Meeting - "I Want My Church Back!" Catholics are starting to push back against the Communist direction of the Church. An irate Catholic man interrupted a California Catholic meeting about global warming junk science this past weekend. The man accused the church of selling its soul screaming, “I want my church back!” This is the latest indication of how many Catholics feel about Pope Francis parroting rhetoric about global government and climate change junk science. The event, organized by Sisters of St. Joseph of Orange, featured a number of speakers, from relief workers to scientists, who parroted the official view that man is causing global warming and that anthropogenic climate change represents an environmental crisis. Earlier this summer, Pope Francis wrote a letter to the world’s 1.2 billion Catholics calling for a new global authority to tackle climate change – a form of world government. The very notion of a “world government” makes many Christians uncomfortable because the Bible makes indirect references to such an “Antichrist” system in the final days, notably in the Book of Revelation. Entitled “Laudato Si: Engaging Pope Francis’ Encyclical on Ecology,” the program for the event featured a number of recommendations for how Catholics could help fight climate change, including eating less meat and reducing their carbon footprint.